Rochester based sculptor Judy Onofrio is the recipient of this year's Distinguished Artist Award from the McKnight Foundation. It's a huge honor and the list of past recipients reads like a who's who in the Minnesota art world including composer Dominick Argento and the writer Robert Bly. Onofrio says she's sill in shock. But those who know and love her work are hardly surprised. Rochester, Minn. — 'Judyland' is truly something else. Scattered across a sprawling backyard hillside in Rochester are mammoth concrete sculptures embedded with slivers of colorful glass, and ceramic chips. Judy Onofrio stands just on the edge and surveys twenty years of work. "We keep adding little areas and I sort of see them as outdoor living rooms, and places for people to gather," says Onofrio. "But the ceramic concrete sculptures are commemorative of certain events." Onofrio points to one piece. 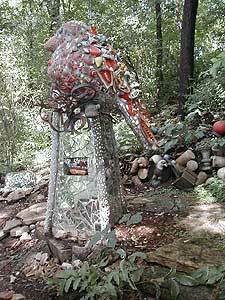 A life-size woman with a birdbath on her head. Her lips are bright red and chunks of broken mirror ring her waist. Onofrio says the piece is a portrait inspired by her mother. A few feet away is another piece with its own story. "I mean that big red bird up on the hill was when rocky my cat ate fuzz my bird and fuzz was buried in that monument like it's a mausoleum," she explains. This is Onofrio's private oasis. She's especially fond of bowling balls and there are many tucked in unlikely spots. All of the pieces stay here year round and for the larger installations that means securing them four feet below the frost line. Her adventures outdoors have transformed Onofrio into an architect slash engineer but her artistic drive is never far away. She says she's compulsive about details and painstakingly arranges each piece of mosaic. The pieces themselves come from around the world -- antique British cookie tins, Japanese china, glass gathered from a mill in West Virginia. Onofrio's lived in Minnesota for the past four decades. Over that time she's acquired an international reputation. Her work's been displayed around the country including the Minneapolis Institute of Arts. She says she can't imagine doing what she does anywhere else. Onofrio says that has a lot do with the fact that Minnesota's artistic community is so tightly bound. "I mean I'm out here in Rochester but I'm very much part of all of that, of this larger community and Minnesota is wonderful that way," says Onofrio. "When I got the award I thought 'Why me?' I know so many fabulous artists in this state that are doing incredible things and they are everywhere you know it's really been. I've been stunned. What can I say? I've been stunned." Onofrio says the McKnight Distinguished Artist Award is the ultimate honor. She says she's still getting used to the idea. Selected each year by a four-member board, it comes with a $40-thousand check. This autumn the foundation will publish a special volume about Onofrio's work and will formally present the award in a private reception. In the meantime, Onofrio busying herself preparing for upcoming exhibitions. A show opens in August in Little Rock, Arkansans and there's upcoming event in Chicago. But what she's perhaps most excited about is a show slated to open in April, at the new Rochester Art Center which even has a gallery named after her.